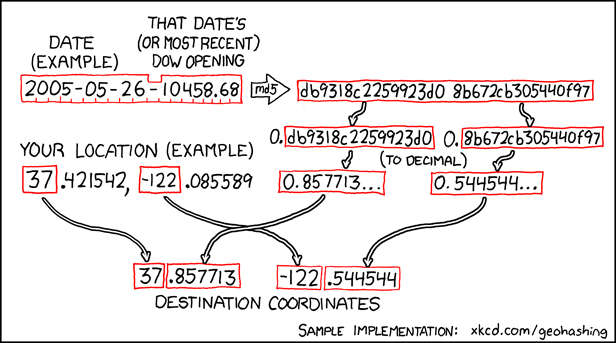 Essentially the idea is that based on some seed data, some complicated sums are done to give a location. People get to that location for a meetup. A map tool is available which does the sums for you. You set the date, click your area and it gives you a location. Due to problems with the seed data (US stock market) and time zones a new rule has been introduced today for people east of 30 degrees west. This is taken care of automatically by the map tool. There are several pieces of code for implementing this - though most have yet to be updated to reflect the 30W rule. The idea is that the seed data is processed using an algorithm called md5. This algorithm produces a 'hash' of the data. it is difficult to find alternate data which produces the same hash. A small change in the data produces a big change in the hash. The idea of a hash is a way of producing a 'fingerprint' of a file. I.e. I could send you a file, but how would you know it hadn't been tampered with? Well, I could phone you, you could recognise me and I could read you the hash of that file (which you can then generate and check). A hash can also be used as a zero knowledge proof. I.e. I wanted to prove to you that I had discovered some fact. I might not want you to know the fact (yet). For example, I might know the first line of the 'Times' editorial for next saturday. I could generate a hash of that line and give it to you - when the paper is published that information can be checked. In this case, the md5 algorithm is used to give a reasonable pseudo-randomisation of one number into another. It's just a bit of fun. I've not gone to a geohash event myself - but I like the concept.